Impress guests with this buttery and creamy Honey Mustard Baked Brie Amandine. 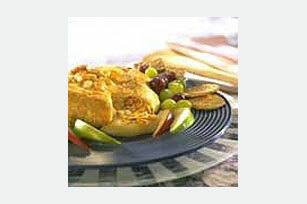 Brie is brushed with honey mustard, topped with almonds and baked in golden puff pastry for a baked brie everyone will rave over. Preheat oven to 400°F. Place pastry on floured surface; roll out with rolling pin to flatten. Brush top and side of cheese wheel with mustard; sprinkle evenly with almonds. Place, almond-side down, on center of pastry sheet. Gently fold pastry around cheese to completely enclose cheese, trimming excess pastry if necessary. Reserve trimmings for later use. Seal edge of pastry. Place, seam-side down, on greased baking sheet. Use sharp knife to cut out desired decorative shapes from pastry trimmings; arrange on top of cheese. Brush with egg. Bake 15 to 18 min. or until golden brown. Let stand 10 min. Serve with the crackers. Spread almonds in single layer on baking sheet. Bake at 350°F for 5 to 7 min. or until lightly toasted. Serve with apple slices instead of the crackers.